Carl Williams, 18, of Onalaska was arrested on May 11th of this year by Detective Christopher Lima. Officers and patrol units on FM-1988 East were part of an established perimeter. Jail Trustee Escapes and Is Caught by LPD, GOODRICH, May 31, 2011 - At approximately 2 pm on May 31, 2011, a jail trustee work unit was working in Goodrich off Wyndham Ranch Road. One trustee proved that he wasn't so trustworthy when he decided to bolt. Indeed, Carl Williams, 18, of Onalaska bolted and search was on. Deputies, Constables, Troopers and the Livingston Police Department were dispatched. Shortly after Williams took off, his black and white striped prison jumpsuit was found. Officers set up a perimeter in the area that went from US-59 at Wyndham Ranch Road to FM-1988 East and nearby subdivision of Goodrich North. Less than an hour after Williams escaped he was caught by Sergeant Ronnie Bogany and Lieutenant Matt Parrish (both with Livingston Police Department). Parrish and Bogany were searching behind a residence when they heard something in the nearby woods. To escape custody is a felony. Police are schooled that when there is a felony takedown, Officer safety comes first, so it is proper protocol to have guns drawn on all felony takedowns. Sergeant Bogany ran over to the area with gun drawn. Bogany and Parrish ordered Williams to come out at gunpoint. Williams was found in his underwear and was taken without a struggle. Carl Williams was arrested on May 11th for Burglary in Onalaska. Sergeant Ronnie Bogany with the Livingston Police Department searches Carl Williams (wearing long underwear) after apprehending him in the subdivision of Goodrich North. Convict Carl Williams is surrounded by Officers of the Law. Transport Officer Bernita Langley prepares to transport Williams back to where he belongs. It's highly doubtful that Williams will ever be a trustee again. On May 31, 2011 at 2:00pm Deputy Ted Everitt, was overseeing the inmate work crew when one of the inmates escaped from custody. Inmate Carl Williams ran into a wooded area off of Windham Ranch, where the inmates had been picking up trash along Windham ranch Road. Deputy Everitt stayed with the remaining inmates and called the escape in. The area was saturated with officers from various agencies who established a perimeter in an attempt to contain the inmate. Lieutenant Lowrie and Captain Childers entered the woods with a tracking Canine and found where inmate Carl Williams had removed his jail issued clothes. The Polk County Sheriff�s Office received a call from a resident on Rios road advising they had seen a subject fitting the description of inmate Carl William, and advised he was running north into a wooded area near Goodrich North Subdivision. A short time later inmate Carl Williams was captured in the Goodrich North Subdivision by Sergeant Ronnie Bogany of the Livingston Police Department. In less than an hour at 2:43pm, inmate Carl Williams was back in custody, with out incident or injury to the public or inmate Carl Williams. Sheriff Kenneth Hammack advised this was a perfect example of multiple agencies coming together and producing a positive outcome for the safety and security of the public. Sheriff Kenneth Hammack advised the Polk County Sheriff�s Office was assisted by the local Texas Ranger, the Texas Department of Public Safety, the Livingston Police Department, Precinct 4 Constables Office, Precinct 1 Commissioners office and reserve deputies with the Polk County Sheriff�s Office. 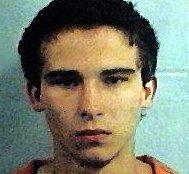 Carl Williams is a 18 year old White Male, being held on a Burglary of a Habitation Charge. Carl Williams will receive a charge of Escape which is a 3rd degree Felony, which caries a penalty of not less than 2 years and no more than 10 years, in addition to imprisonment if found guilty of a third degree felony inmate Carl Williams could also be punished by a fine not to exceed $10,000.00 or both.